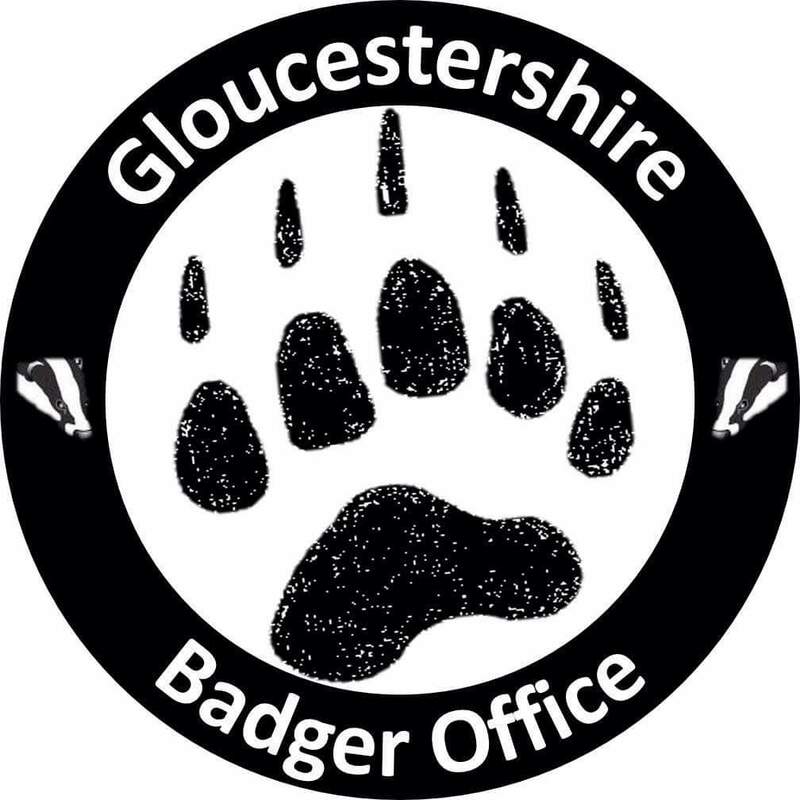 Gloucestershire Badger Office was set up in 2013 as a collective in response to the government’s decision to cull badgers in parts of the county. For the next four years we coordinated hundreds of people, autonomous groups and individuals, always keeping an overview and ensuring that the ‘zones’ were surveyed for badger setts and monitored throughout the culling periods. 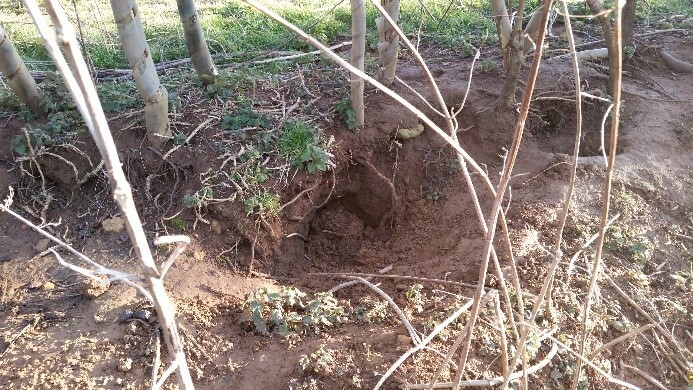 Outside of these periods we also worked with others in order to monitor setts, looking out for local foxhunts who routinely block setts to prevent foxes escaping below ground, and disturb badgers in the process, as well as other forms of wildlife persecution. Current GBO roles… people within the collective generally play different parts. At the moment we have 2 people working on regular fundraising and another 2 keeping an overview of funds and managing the bank and PayPal accounts. 1 person has taken on the majority of camp / welfare coordination over the years with others chipping in. Our arrestee support person is always on call but lives out of the area with an otherwise busy life (and luckily hasn’t been needed much over the years). Police liaison, on the other hand, is a connected, but much bigger role, being needed outside of cull periods a lot more as well. Media is an area we’re trying to improve on, though we’re pretty sorted social media-wise as our reports are written up by any of our admins in the above roles, plus those focusing more on coordination of people on the ground, for sett-surveying, during the cull and for emergency call-outs. Website updates are mainly organised by one of the admins. 1 of the coordinators is currently mapping all known setts on a central database for the three counties while another has more of an overview of upcoming events such as sett-surveying training days run by us and country shows and other events which we could go to and raise awareness. The public phone line is held by one person at the moment but with various others able to take on the role, even during the intense cull periods. Intel obviously comes through to us via social media and the phone line as well as from people we meet whilst our, but we also gather our own, doing our own research though this usually falls to whoever is interested in a particular angle or has certain knowledge on an issue, so isn’t the responsibility of any individual specifically. Logs are kept of reports and intel by a few of the collective. A few of us write articles and information for wider dissemination with a collective member who has good contacts for printing and so on. It’s only when we write it down that we realise just how busy we are… and that’s before we talk about daily sett-surveying, meetings and talking to those who call in! We have learned a huge amount over the last four years and have met hundreds of dedicated people… one thing we wish we had done more of in the run up to the first year of the cull and between subsequent culls is having more public events, leafletting and so on, trying to engage more with others locally – some of us are quite openly vegan / pro-animal liberation / anti-cull but many people don’t feel so comfortable in their local communities and some were busy on their own trying to save badgers without any support or idea of how many others were out nearby doing the same. Not everyone is on facebook either. The last four years have been intense – our public phoneline receives thousands of calls and messages during the culls and a large number of calls for information and advice and with tip-offs even outside of the culling periods. We gather intel, organise camps, fundraise to help with fuel costs and coordinate resistance on the ground – everyone in the collective has their own role/s in addition to physically being out in the fields. 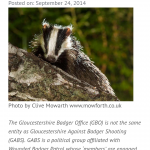 We became especially busy when the cull rolled out to two new areas here – another zone in Gloucestershire (the ‘North Cotswold zone’) and a zone in nearby Herefordshire. With uncertainty over how long culling periods will last for in future culls and how many more zones culling will roll out to, with landowners taking on the majority of the groundwork themselves instead of bringing contractors in from elsewhere, and wildlife persecution an ongoing daily issue across the country, we strongly believe that it will not be possible to coordinate anything in the same way as we have been doing again. With more zones becoming active there won’t be the same numbers of people flocking into cull zones, especially if the culling lasts for longer periods of time. Sett-sitters and patrols, autonomous groups and individuals can’t cover every sett all the time throughout these periods and much more work will be intel-led. There are already lots of people out there working on their own projects to highlight what is going on, gathering and collating evidence, for example, of hunts blocking badger setts in current and potential cull zones and other breaches of biosecurity and cull guidelines – how can culls continue to be licensed and given the go-ahead, badgers being scapegoated while certain humans get away with behaviour that is much more likely to spread bovine TB? Resistance to the cull and wider wildlife persecution has grown and will continue to grow organically and this is going to be the most effective way we combat it in future. 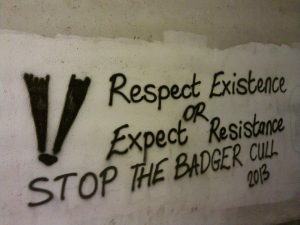 We get a lot of messages through from people saying that they wish they were younger, fitter or that they lived closer or had more time free as they would love to get involved… but there is almost always something that everyone can do much closer to home and in their own time, whether or not the cull is coming to an area near them. Our advice is to join or set up a local group in your area, get your heads together and work out what you want to achieve and learn. 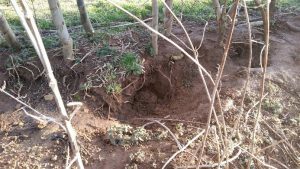 If you’re in the country, get sett-surveying, looking for badger setts near you (and as you go, signs of tampering, blocking and digging-out, snares and so on). 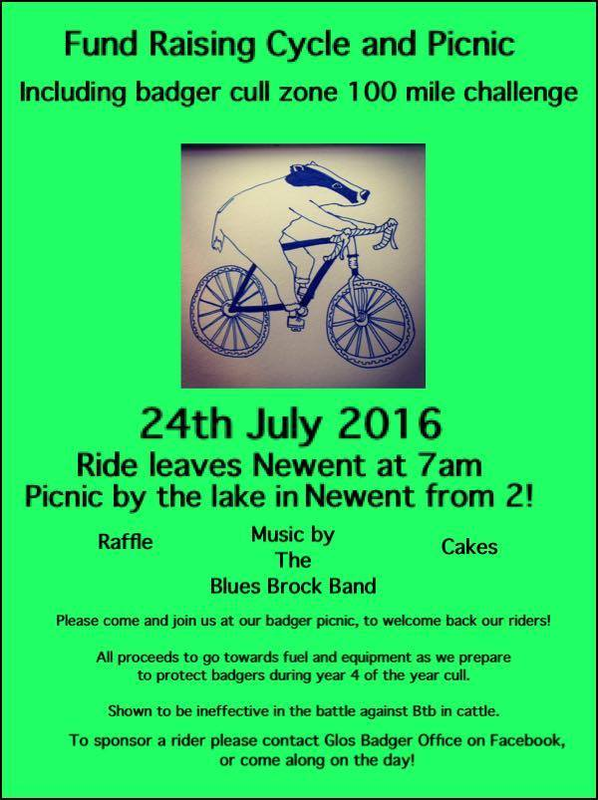 In more built-up areas there may well still be badger setts and foxes may be more persecuted in these areas too. Urban sprawl affects huge numbers of animals and their habitats. 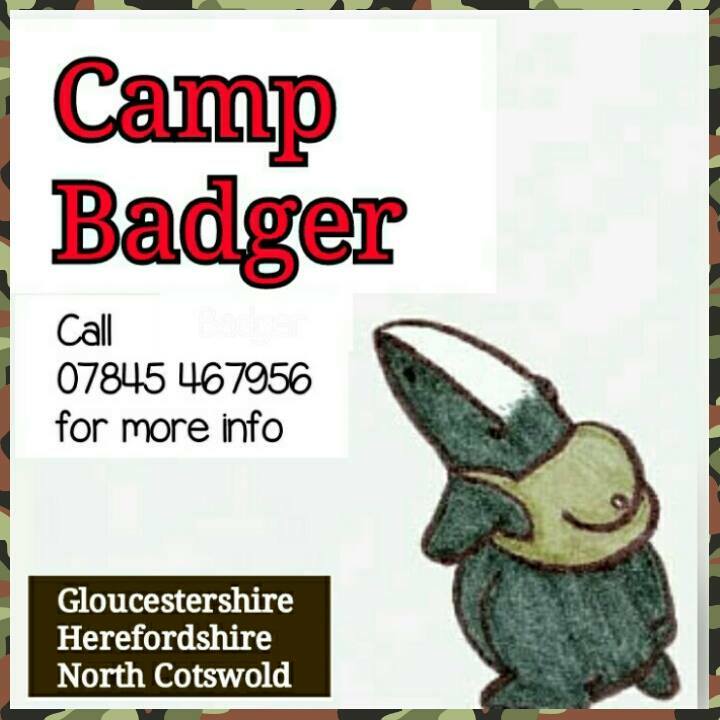 Even the culls take place right near towns – the cull zones here go right up to Cheltenham and Ross-on- Wye and smaller towns such as Tewkesbury and Stow-on- the-Wold. Across the country we hear reports of poachers being spotted, illegal hunting activities, illegal trapping. You don’t need to live in or near a cull zone or wait for culling to happen near you to do something. We talk about recruitment a lot and how better to get more people involved than to set something up in the area in which they live? 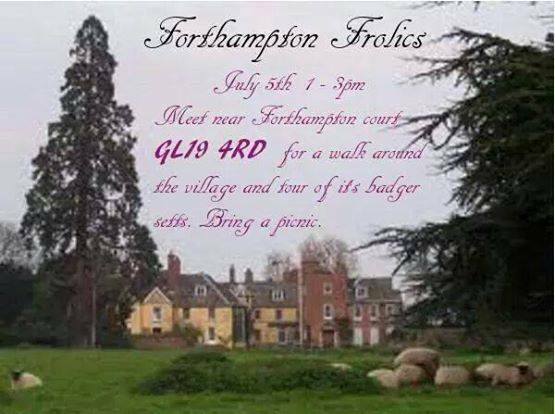 Who better to gain local information about wildlife persecution and to build networks with others in the area than those who bird-watch or walk their dogs nearby or who have lived in the area for years? It’s also easier to build working relationships with police wildlife officers or local businesses if you’re not seen as an outsider. 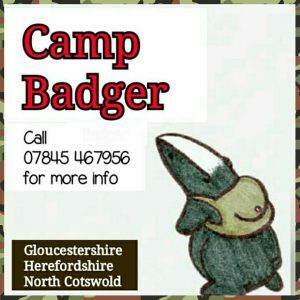 The cull may well become too big and spread out to resist in the same way as we have been… but with a large number of groups working in their own ways across the country, networking and communicating, learning and teaching and fighting wider persecution than the cull alone, more wildlife will be helped and more awareness raised. Whether you’ve got a couple of hours before or after work to check on setts close by, have a day free at weekends to gradually sett-survey a bigger area or only have time during school holidays, there’s something you can do. It doesn’t matter how fit you area, how far you can walk, whether your whole family is involved or just you, there’s something you can do. The Gloucestershire Badger Office collective have decided to carry on working as one such local group while also providing advice to and networking with groups much further afield. We’ll continue to coordinate on the ground in the zones in this area when the culling begins again, but we no longer want to focus on the cull as a single-issue campaign. Resistance to wildlife persecution can become a part of ‘daily life’ – we check setts as we walk our dogs, some of us have caught poachers whilst out on bike rides because it has become second-nature to notice suspicious activity and we’ve learned what is ‘normal’ in the areas in which we live. 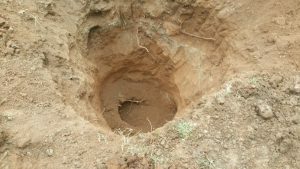 On top of this, we run sett-surveying training days and various workshops as well as providing information to others through producing leaflets and writing articles. 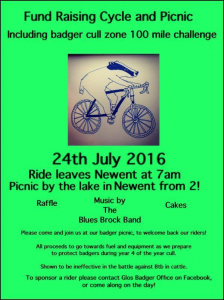 None of us are anything special, we’re not ‘younger’ or ‘fitter’; we just do our bit. And we want you to know that you can too. As much or as little as you want to. And we’ll be here to help if you need us.